A unique place in France, it’s the first museum fully dedicated to our food, the food we eat every day and special holiday food. The museum Maison Régionale des Arts de la Table offers Burgundy natives and visitors the opportunity to discover or re-discover the art of eating, an art which the daily bustle of our lives does not normally allow us to appreciate as we should. Since 1981, the Maison Régionale des Arts de la Table, housed in the former Saint-Pierre hospice (17th century), has been opening its doors for 7-month exhibits organised around the essential elements of the art of living: food, gastronomy, everything gourmet…and the art of eating. 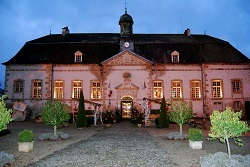 The museum Maison Régionale des Arts de la Table won the Tourism Cultural Trophy in Burgundy in 2009. Loyal to its primary vocation of teaching about common household objects, the fittings that retrace the history of the art of eating. The French pottery faïences patronymiques, associating a given name or surname with the image of a martyr or a patron saint, first appeared in the 18th century. Between 1789 and 1799, everything began to talk and be labelled: dishes told the erratic story of the French Revolution and spread word of new ideas. Mottos such as “Long Live the King” and “Long Live the Nation” as well as allegories of justice and equality were plentiful. As is often the case, it was in England, in the mid-18th century, where decorative labels and banners were invented as a way to transfer the decor which modified the technical and economic means of producing faïences. This new print process spread throughout France as of 1830. Most often produced were dessert plates, produced in series, with themes reflecting 19th century events and social life: the history of France, the map of tourism and colonial grandeur, the great princely families, World Expos, the most recent technological innovations such as the railroad and automobiles, the fables penned by La Fontaine and hunting or horse-riding stories. There were plenty of riddles, rebuses, puzzles and proverbs of all kinds to liven up festive meals. Unavoidably, the play and silent film “Fun in the Barracks” popularised a friendly and merry image of the French army before World War I brought back the cruel reality. 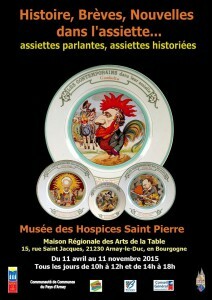 The backs of these dishes are marked with the stamps of well-known manufactories: Gien, Creil-Montereau, Choisy-le-Roi, and Saint-Amand or, on behalf of Lorraine, Sarreguemines, Lunéville and Longwy.